Throughout the world, the long white cane is used by people who are blind or visually impaired as a tool for safe and reliable navigation. The white cane is a symbol of the user’s skills and talents, mobility and independence. It also allows the sighted person to recognize that the user is visually impaired. The International White Cane Safety Day of Octob er 15th gives Lions an opportunity to increase awareness of the white cane traffic safety laws. The National Federation of the Blind (NFB) offers a long white cane to people in the USA who are blind. How do Lions Clubs Contribute through White Cane? 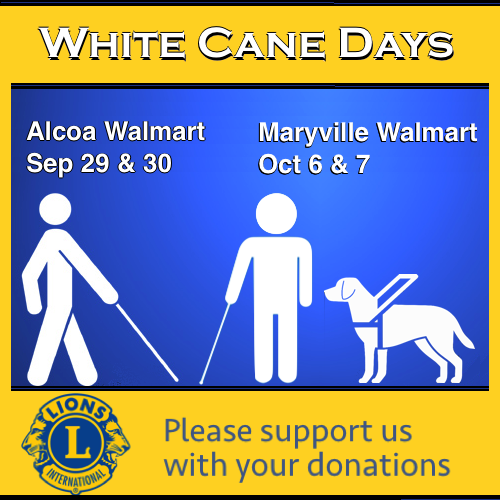 If you see one of our volunteers collecting money outside of Wal-Mart in the Fall please stop by and drop in a few dollars. If you aren’t one to carry money, you can make an online donation using your PayPal Account or Credit Card. You can even make a memorial donation to honor a loved one. The donation button is located on the front page of our website. Thank you for helping the Lions in our mission to SERVE.